Aruba is a very arid island. The contrast between tropical Caribbean dreams and the desert landscape couldn’t be any starker than it is on the coast, where cacti grow straight out of white beach sand. The sheltered SW side of the island is famous for its beaches and snorkeling. Barret and I spent our first morning at Malmok Beach, which is smaller and quieter than the resort beaches further south. A large iguana lounged against a white wall while turquoise-speckled Aruban Whiptails scurried out from the shadows. One accidentally grazed the top of my hand with its soft underbelly and scratchy nails. Along the coast pelicans swooped into schools of fish while small boats cast their anchor further out. The tour boat blasting dance music was named Putin Pleasure. I blinked twice and realized the palm tree logo in the font was meant to spell out Palm Pleasure. The NE side of Aruba has pounding waves and a jagged coastline reminiscent of shards of glass. A good portion of this coastline belongs to the Arikok National Park. The relentless sun beats down year round and is the reason only stray goats cross this desert landscape on foot. A rental car is the best way to visit to Arikok. The coastline north of the national park is unpopulated and largely difficult to reach without 4WD. The Bushiribana Gold Mill Ruins is one of the few buildings that sits along this stark coast and is accessible by a paved road. The mill was built in the late 1800s and was in use until being replaced by the Balashi Mill on the other side of the island. Balashi operated until WWI, when the imported mining materials became impossible to secure. After the war, the neglected mill was in such a state of disrepair than no further production was pursued. Close to the ruins is the former location of Natural Bridge. As its name suggests, it was a strip of land that spanned across a rugged cove. Although nature eventually had its way and the bridge collapsed, tourism still prevails. A wooden ladder has since been constructed which allows people to access a small, protected pool during low tide. My friends and I happened to be there during high tide and it was one of those moments where I could imagine the following day’s headline: Security measures to be proposed in wake of tourists being dragged out to sea. Leaving the ruins, along the single paved road, was my favorite gift shop on the island. It was actually a wooden shed on private property, but it had a massive collection of driftwood painted to look like colorful fish. It was folk art at its purest and I didn’t see anything like it near the cruise ship docks. The Alto Vista Chapel can also be found on the desolate NE coast. It was built upon the location of the island’s first Roman Catholic Church. While the building itself attracts tourists and Tuesday evening service-goers, the most compelling reasons to visit are the sunsets and the footpaths through the cacti-filled landscape. Downtown Oranjestad, with its colonial architecture, is actually quite small. Aside from a spattering of museums, retail shops dominate the landscape. The National Archaeological Museum, which is free to the public, is located inside the former Ecury Complex. The buildings, some of which date as far back as the 19th century, remained in the Ecury family until 1997. Today, the complex is a modern museum with a focus on Aruban Amerindian culture and the country’s colonial heritage. Papiamento and Dutch are the two official languages, but Aruba is much more linguistically savvy than that. Because the island receives a significant amount of tourism from the US, English is very widely spoken. Most of the ATMs dispense US dollars and stores usually expected me to pay in USD. I, of course, took all my money out in Florins and every time I went to the store I felt like the kind of tourist that wears a beret in Paris. Spanish is also understood because of the close proximity of Venezuela and it’s hard not to notice that most of the independent groceries stores reflect Chinese ownership. Outside of Oranjestad’s historical area, the majority of homes are one-story bungalows. They come in an array of colors and would not have been out of place during the 1950s. After a few days of driving around the island, I thought about the couple at the airport that passed through immigration before us. This was their 28th visit to Aruba and they were excited to be back. No matter how much I’ve enjoyed a destination, I’ve never felt that strongly about one place. I liked Aruba and I loved the desert sunsets, but the One Happy Island was a little too small and commercial for me. I’d dipped my toes into Aruba and it just left me curious about all the other Caribbean islands. Good thing we’d already planned on jumping over to Curacao. I play volleyball with my SENA colleagues twice a week after work. The volleyball court is across the road from the campus and is reached via an underground tunnel. From here, the view of the school and the hills and the mountains that rise up behind is absolutely stunning. Sometimes the view is so pretty, especially during a sunset, that I have a hard time concentrating on the game. For this reason, when some friends of ours wanted to hike the mountains nearby SENA, I was excited. I knew how scenic the area was. We caught a buseta that went through Gallinazo and exited at a fork in the road. 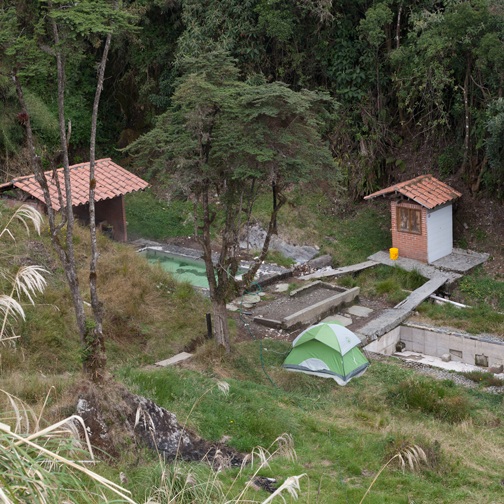 To the right was a hot springs complex and to the left was a narrow road that eventually led to the volcanoes and the páramo of Parque Los Nevados. Aside from a few bicyclists and motorcyclists, the bumpy uphill road was quiet. As we walked the morning fog moved in. Birds called out from the surrounding trees and rivulets of water trickled down the side of the road. The landscape was so peaceful that it was easy to forget how much volcanic activity was underneath our feet. Nature can be deceiving like that. When we stopped for water Barret heard a strange noise. It sounded like a lid bouncing on top of a pot of boiling water. 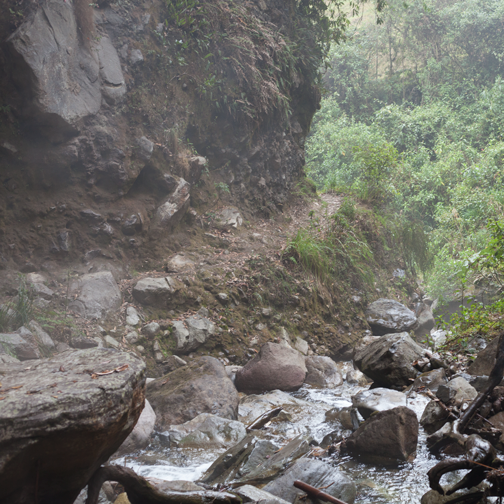 He searched the side of the road until he found a small vent – a hint of the volcanic activity below. The gurgling was punctuated by a puff of steam that dissipated as silence fell. A few seconds later the gurgling began again. 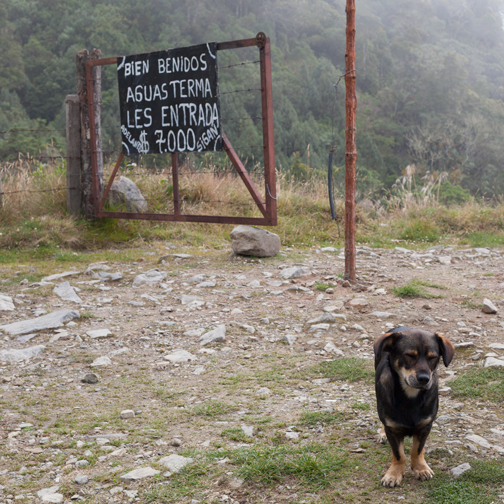 After four hours of walking uphill, we reached our destination- La Gruta. Outside the grotto was a memorial to a group of Boy Scouts that were killed there in 2006. They had hiked up the very route we had just taken and were swimming when a surge of water suddenly appeared and swept them away. The clouds hung low the afternoon of our visit. 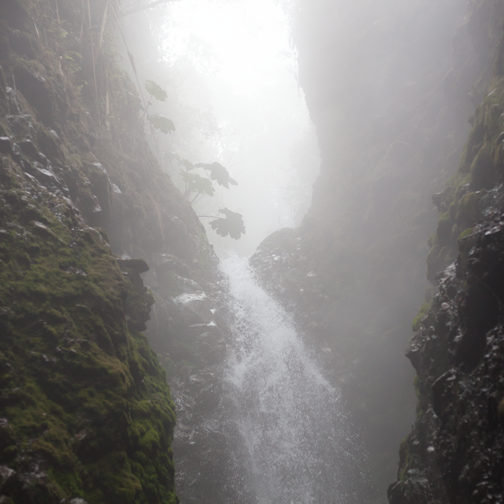 The waterfall was at the far end of the grotto and closer to the entrance was a pool of hot, steamy water that poured out of the rock face. The water that flowed out of the grotto passed under a bridge before heading down the mountain. Down the road from the bridge was the only building we had come across on our four-hour hike. A man walked out from an open door and asked us if we wanted a cup of aguapanela or an arepa. 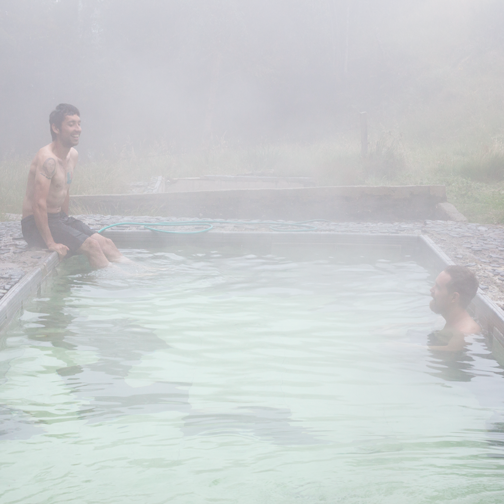 We had brought our own food, so we declined and continued walking until we reached a small outdoor hot springs. We passed through a metal gate and asked the caretaker if we could eat lunch atop the sloping hill. Below us was a small concrete pool filled with thermal water and the remnants of a second pool. A long green hose poured cool water into one end of the pool while piping hot water flowed into the other end. 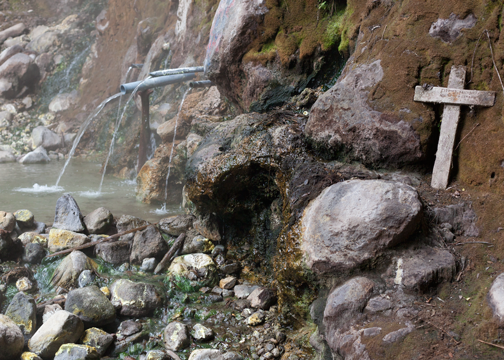 When a group of four left the hot spring, we walked down the grassy slope and changed into our bathing suits. The afternoon was foggier than ever when we got into the water. My cold feet began to tingle and my tired shoulder muscles slowly relaxed. 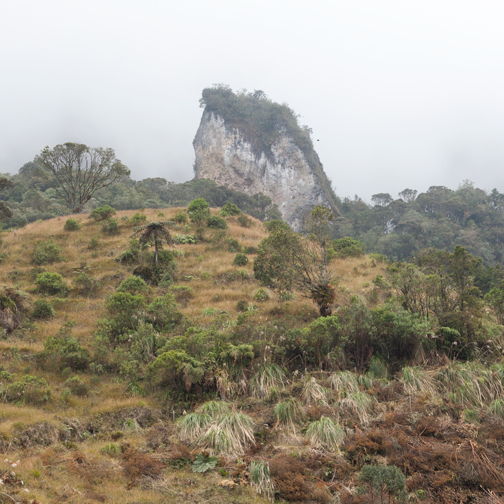 Every now and then I saw the caretaker strolling the hill above; he was a poncho-clad silhouette in the fog. If it weren’t for the steep terrain, I would have thought we were in the British moors. On the way back down a jeep pulled over and offered the four of us a ride back into town. We jumped in and tucked our legs up on a hard plastic kennel. Metal beams crisscrossed the ceiling of the jeep and I crouched down so that my head wouldn’t hit the roof every time we bounced over a rock. Including us, there were nine adults, one baby, and one dog in the car. It felt like we were hitching a ride in the middle of nowhere, hundreds of miles from the nearest city. 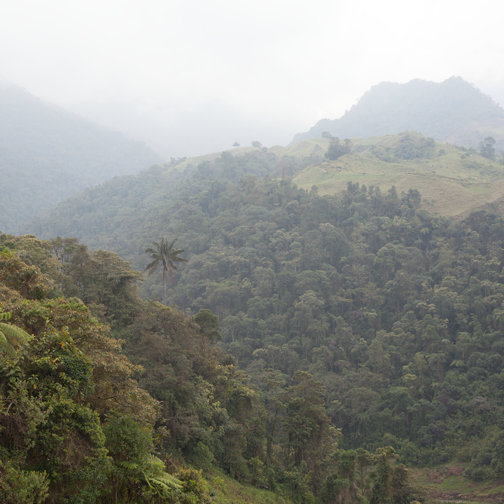 However, within the hour we were dropped off at a gas station across from the Manizales bus terminal. Moments like that are when I feel very lucky to live in Manizales.